You guys, you need to make this. Can I confess something? It was so good, I ate it for dinner and then again for a snack! Yum, and also *burp. * Excuse me during this gluttonous time. And I put them in a bowl with 2 cups of boiling water. 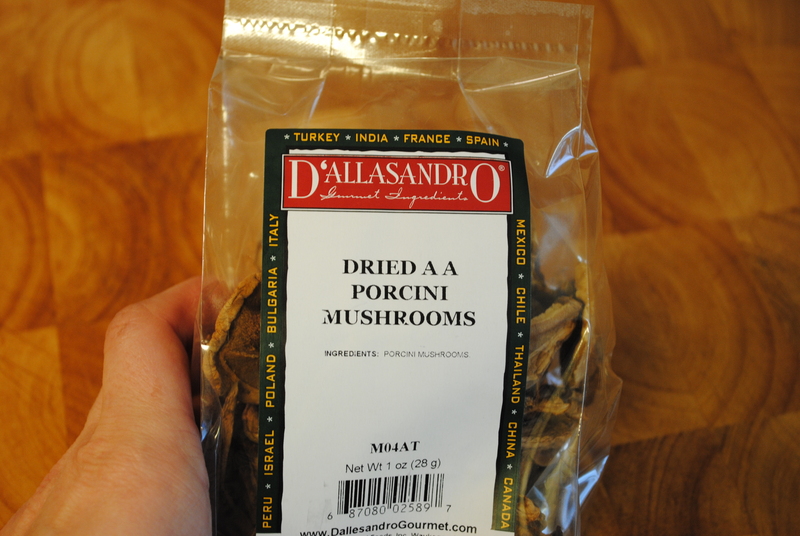 The BC’s recipe called for dried morels and Tyler’s used these porcini. How did I decide? Well morels are about $10 more for an ounce so I went with the cheaper option. 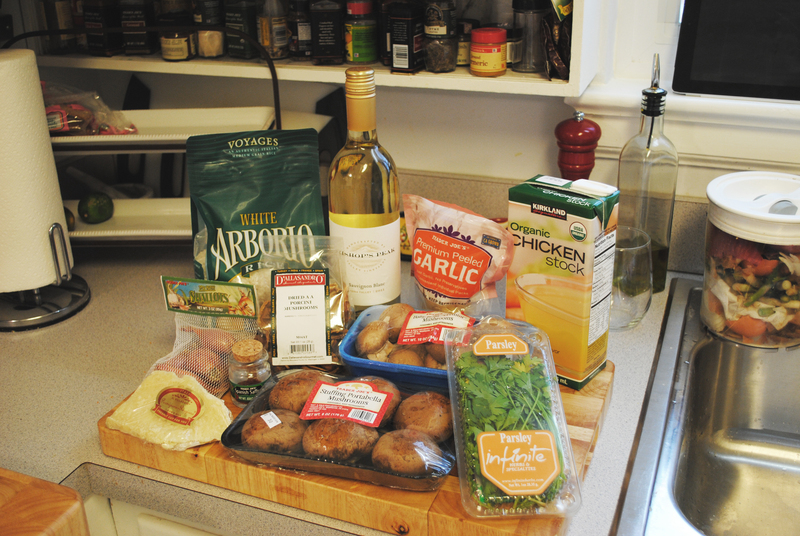 I love the BC but sometimes a woman has to budget! 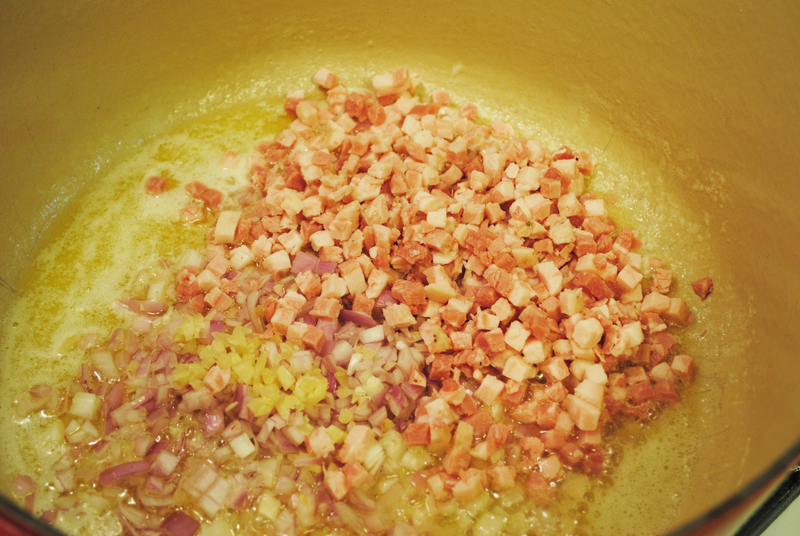 Then I took the carton of chicken stock and put it in a sauce pan over medium heat and let it come up to a simmer. 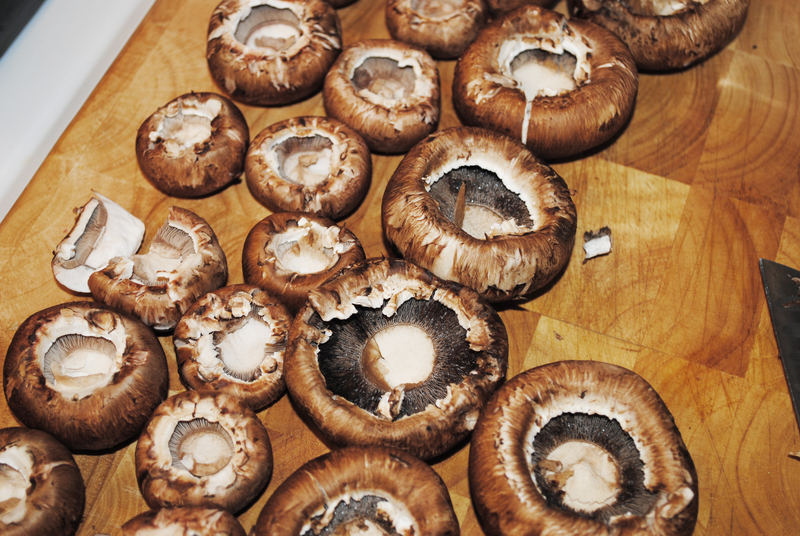 While it was warming, I scrubbed and removed the stems from the crimini and portabella mushrooms. 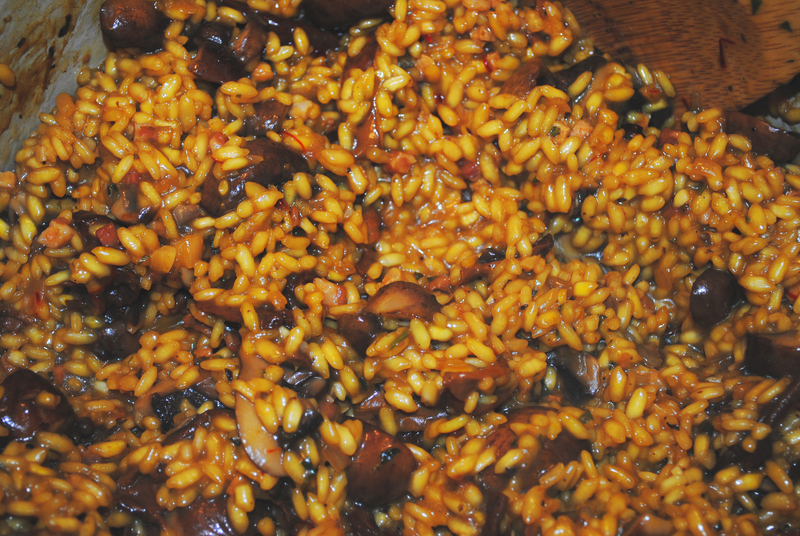 I used 6 oz of crimini and 10 oz of portabella, but use whatever combination of a pound you can find. 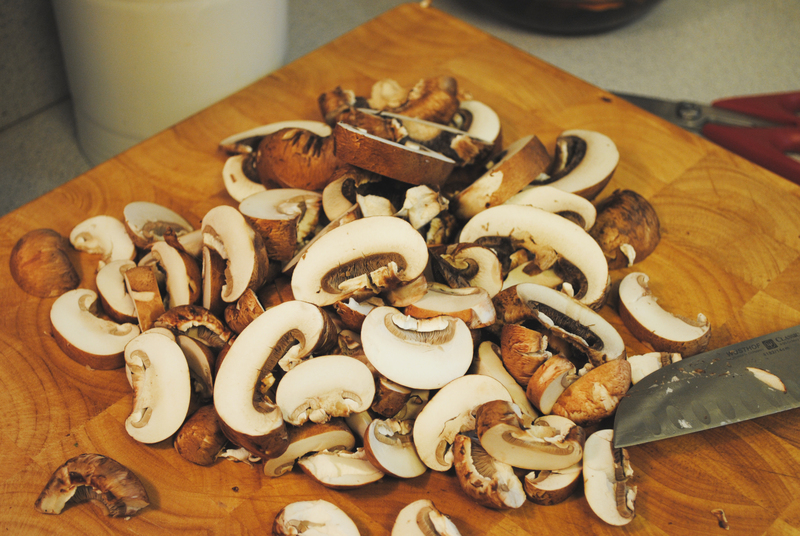 Then I sliced them into about 3/4″ slices. This was about 4 slices per portabella and 3 slices per crimini. 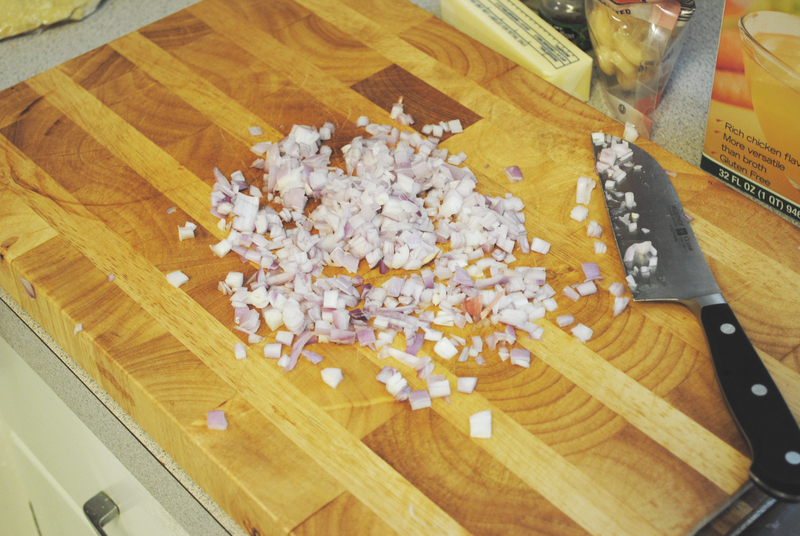 Then I minced about 4 shallots so I had about a half a cup. 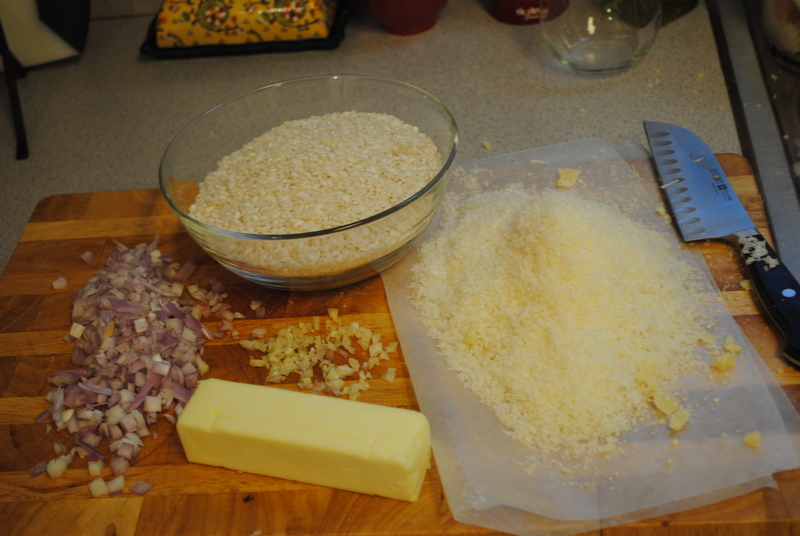 I also minced 2 cloves of garlic, and grated about a cup and half of parmesan cheese, but that ended up being a little too much, a full cup is probably enough, just depends how cheesy you are. Sorry I called you cheesy. 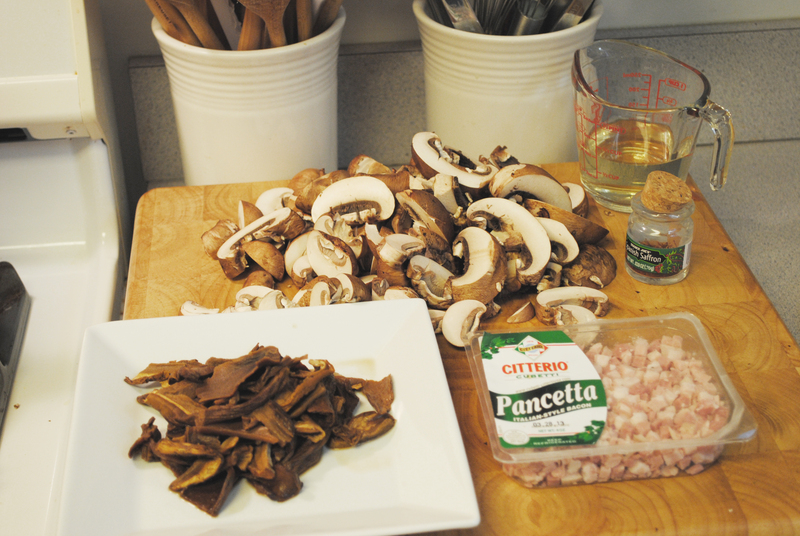 Then I took the porcini mushrooms out of the water they were soaking in and set them aside. 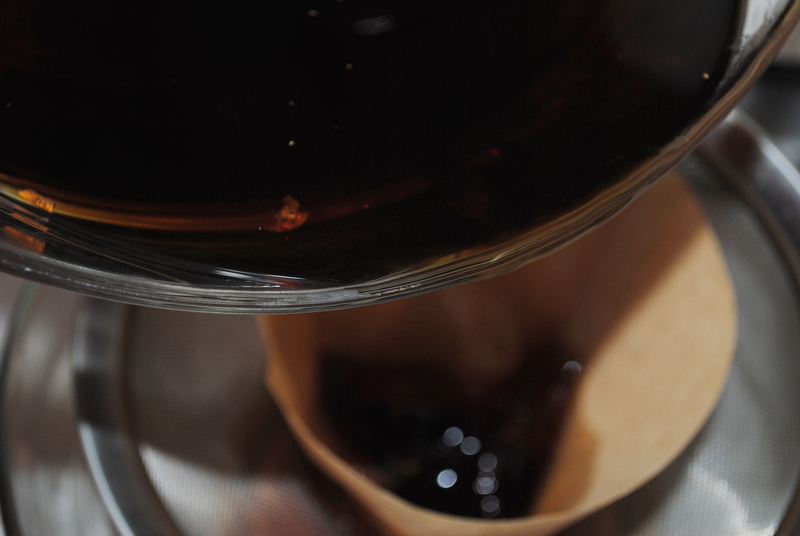 I grabbed a mesh strainer and a coffee filter and strained the brown water through them both. I added the strained water (about 2 cups) to the chicken stock on the stove and continued to let it simmer lightly. Doesn’t that look delicious? It gets better if you can believe it. Come on, I’ll show you! 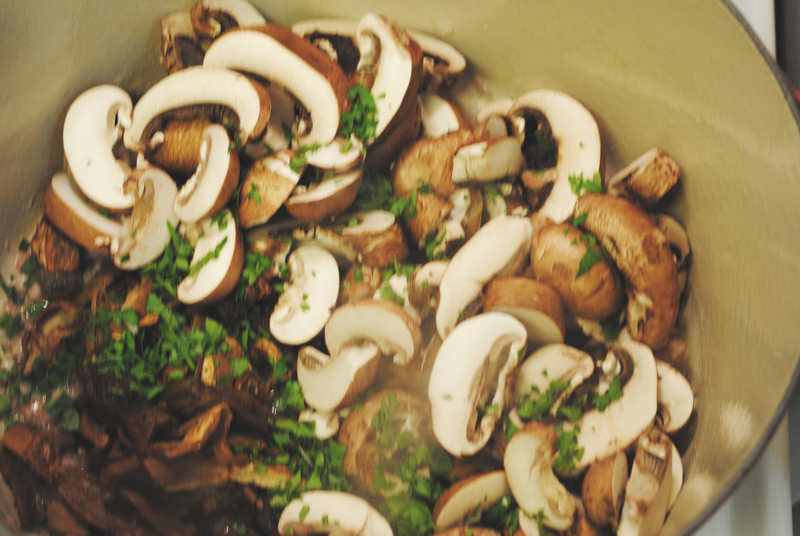 After about 5 minutes, add all the mushrooms and if you have some parsley, chop it up and throw in a tablespoon or two. Yum city right? 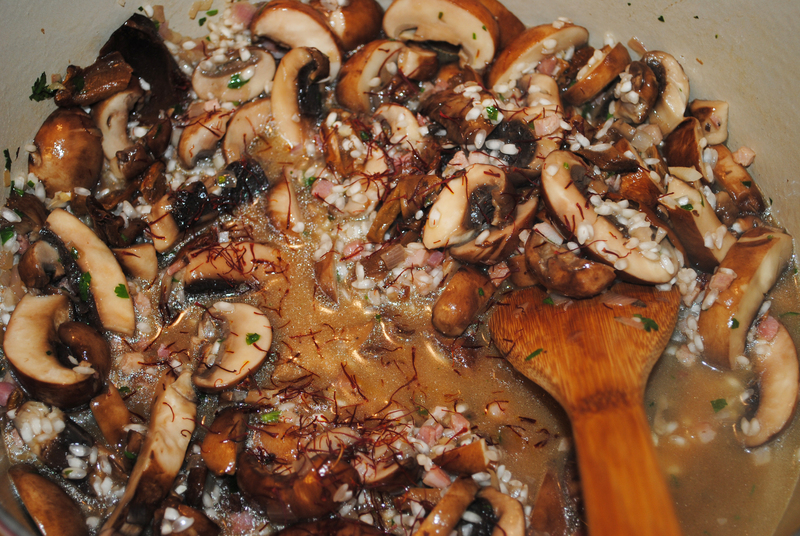 Stir it around to get it all coated in the butter and then it cook for about 5 minutes, until the mushrooms start to soften and the butter is absorbed. 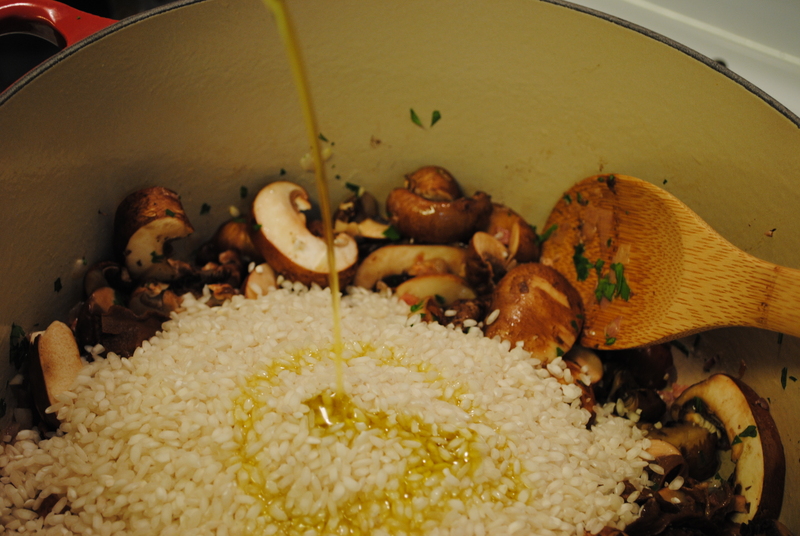 Then add 2 cups of arborio rice and tablespoon of olive oil. Stir to combine all the ingredients and make sure that the rice gets coated in the oil, then add about a half a cup of dry white wine and let cook for about 2 minutes. Then I added about a cup of the parm, stirred until it was coated and then served it in a pasta bowl with a little more cheese and parsley on top. I poured myself a glass of the wine that I used in the recipe and then I moaned and groaned through the entire bowl (all by myself because no one was home except the dogs who already think I’m weird.) Gosh, it was yummy! Seriously, make this and make it soon. It’s a perfect Winter Weekend delight! 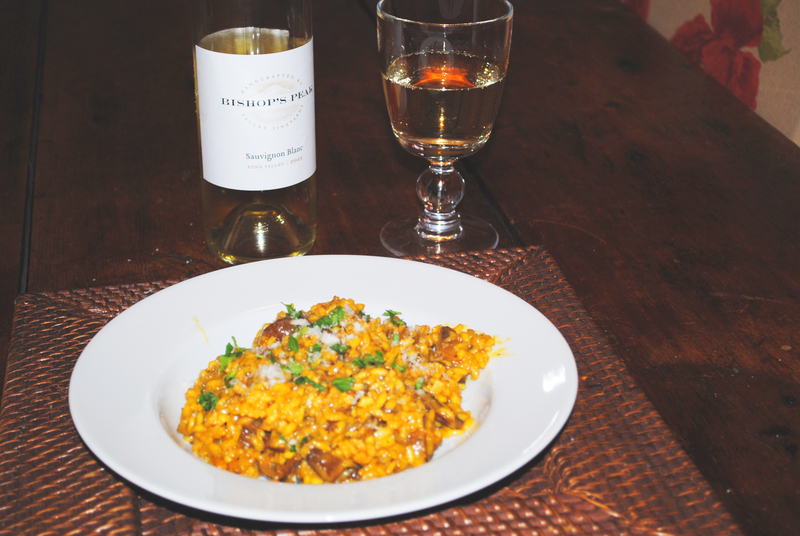 Here’s a link to the recipe. This week I fooled around…with some software. 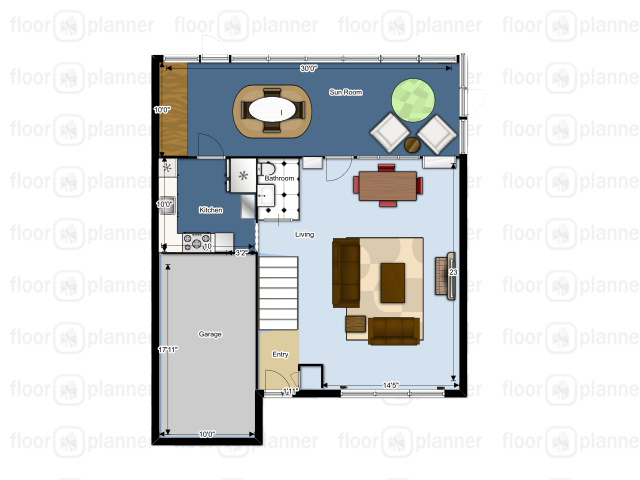 I checked out www.floorplanner.com. It’s a free design website that allows you to create (wait for it….) floor plans! I know, right? Anyway, the software takes a little getting used to. It’s not as user friendly as the IKEA kitchen software, but allows you to do much more. I was able to create this to scale 2D floor plan of the main level of our house. What’s nice is that this allows me to really get a good grasp on the layout of the house, floor by floor. I’m a real visual person who also struggles with spacial relationships (my mom says I’m very special), so seeing things from this view as well as the 3D are super helpful for me. Now I am able to better understand the flow of my tiny cottage and get an idea of how big (or in my case small) the rooms really are. Doesn’t my kitchen look tiny? Considering that none of this has cost me any money, I would say that I would really recommend www.floorplanner.com to anyone looking to make changes to their house, whether they are simply re-painting a wall or considering a major add-on. It’s a really helpful tool even if you have to stick with it for awhile before you become comfortable with how to use it. Happy Friday Everyone, we’ll be at Julia & Alex’s for the Super Bowl. 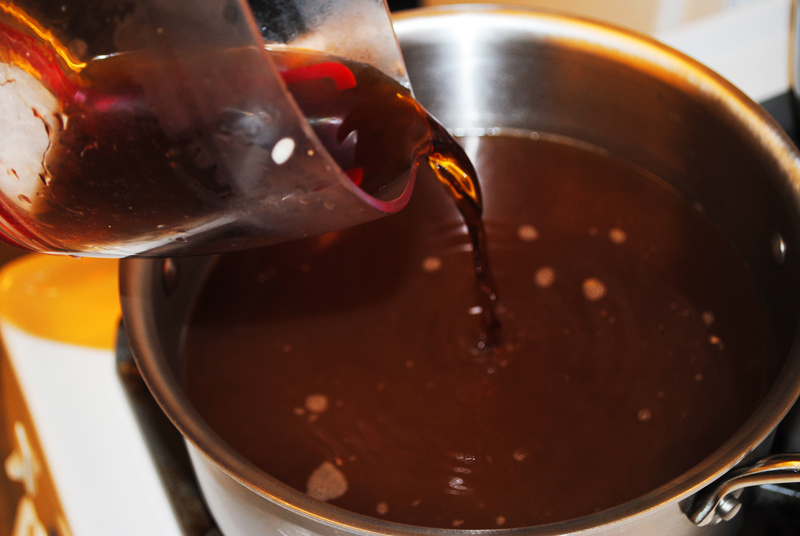 I’m making Mississippi Mud Pie, recipe and how-to will be up shortly.